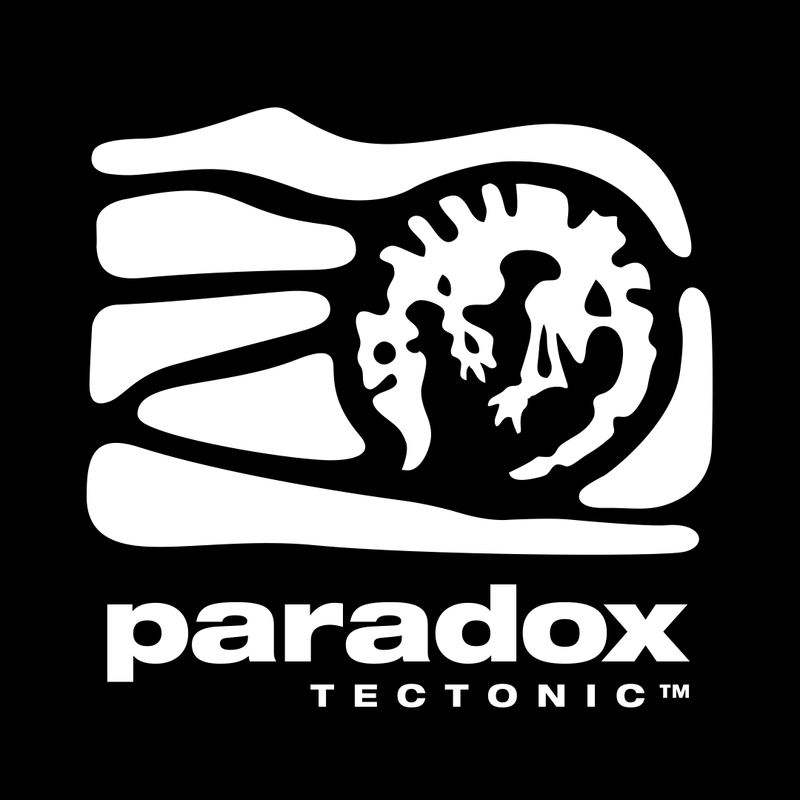 For those of you just joining us, hi, my name's Lars, I'm some random indie game developer you've never heard of who made a random game you've never heard of, (out now on Steam and consoles!) and I have a lot of opinions about how to do HD Remakes the Right WayTM. This is not to say that I think my own games' art styles are unimpeachable or that I'm so great, (far from it), just that no matter how small your budget or simple your approach, there are some well established best practices for presenting classic games in the best possible light, regardless of the player's subjective personal taste. These techniques are cheap, straightforward, and easy to implement, and I'm giving them away for free! But somehow, Square Enix, despite their comparatively unlimited resources and rich collection of history's most beloved RPG's, isn't getting the message. - Compatible with Apple TV. Which seems to be the same set of graphical "upgrades" that match the day-one Steam version. Okay so, this is quick and dirty, and with the proviso that the original mobile version didn’t look fantastic itself. But here are a few comparisons of the iPhone CT and the new multi-platform CT. In other words, at least as far as graphical presentation is concerned, the team that made the original mobile port may very well have had nothing to do with this. It's entirely the fault of whoever directed these most recent changes, which follow a clear pattern set by the FFV and FFVI HD remakes also released on Steam. If you're reading this on a phone, images might not be at the proper scale for you, making some of the points the article makes harder to grasp. 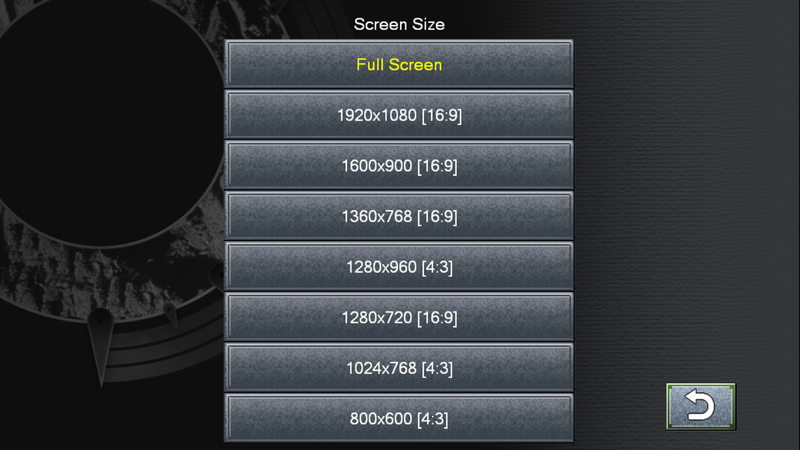 Each image can be clicked for a full resolution version. Those of you into the emulation scene might know about upscaling filters. I talked about them in the previous articles. Of course, that's not exactly how you would have remembered seeing it. It's a matter of subjective taste whether you prefer 1:1 upscaled blocky pixels or whether you prefer the "classic look" with simulated scanlines, CRT color bleed, and even screen curvature. But we can leave that aside because instead of opting for either of these techniques (or even better: letting the user choose), they've again opted for the worst of both worlds. 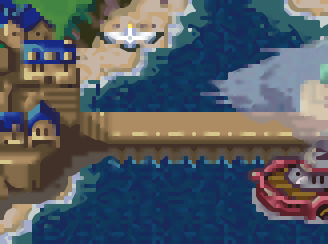 Some elements are fully pixelated (the boat, the seagulls), some have an upscale filter applied (the houses in the village), and some are pixelated with a bilinear filter slapped on top (the clouds, which are transparent to boot). To top it off, scaling is inconsistently applied at a non 1:1 ratio - at 1080p resolution, the boat features pixels variably scaled at 7x5, 6x5, and 5x5. Absolutely none of this is consistent, and does nothing to make the art look better than the original, regardless of one's taste. 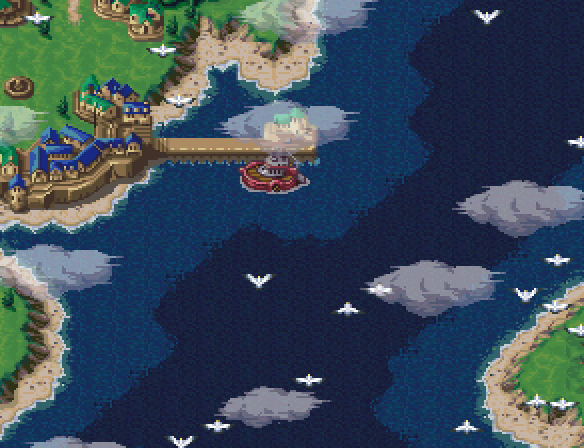 Here's the boat from the SNES version, sized up to match. It's not a 1:1 comparison because the color model is slightly different, the birds and clouds are in a slightly different place, but you get the idea. So. Let's try some filters! Mmmm, okay. Admittedly not great. But at least they're consistent. But the real tragedy here is that until someone makes some mod tools to undo some of this stuff, users cannot fix this themselves. I can't even run the game's raw pixel output through a 3rd-party visual tool to do custom post processing, because the output is corrupted with these artifacts. Update March 2, 2018: Ask and ye shall receive! Jed releases a tool that fixes some of the issues. But this is about a lot more than just filters. Once again, it looks like Square has been applying upscalers to the tile sheets themselves rather than the final output. 2. Thou Shalt Not Exacerbate Tile Boundaries with Upscaled Assets! This problem is caused by two things -- 1) upscaling tilesheets before you compose them, and 2) the insecapable nature of pixel art itself. Now let's run it through some random upscaler. It looks like Square used something like the HQ 2x filter, which will be close enough for this example. Okay, maybe not perfect (I'd have preferred HQ4x or XBR myself), but pretty good, right? These seams don't have to be there, even with upscaling. The key is you need to take your tiles and put them in a natural mockup image with their true neighbor tiles, scale that as a finished image, extract tiles from that finished image, and piece them back into the compacted format so that the edges line up properly. This may sound like a lot of tedious Photoshop work, but any competent programmer can automate it with a script that an artist can operate with one button. Some seams are a bit trickier, however. Algorithms can't do everything. FFV and FFVI had this problem too. 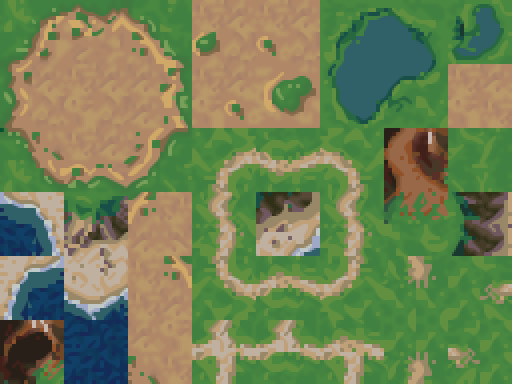 The thing is, these tiles were originally designed for lower resolution, so these sort of little discontinuities were easier to fudge. Particularly because every single visual element was confined to the same pixel grid, the entire image was effectively a mosaic and it was much easier to "hide the grid." 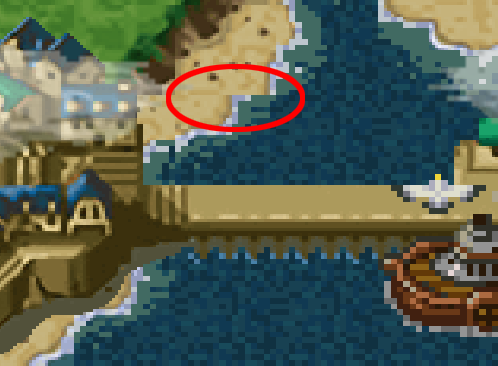 When you scale tiles up without adapting to them to the larger viewing size, and especially when you apply scaling filters, these kinds of problems just get worse. 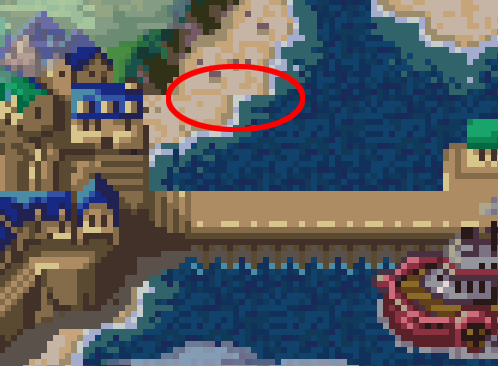 Before, you could count on the pixel grid to obscure the boundary grid between tiles, but the smoother (and smudgier) things get, the harder it is to hide those sharp lines. 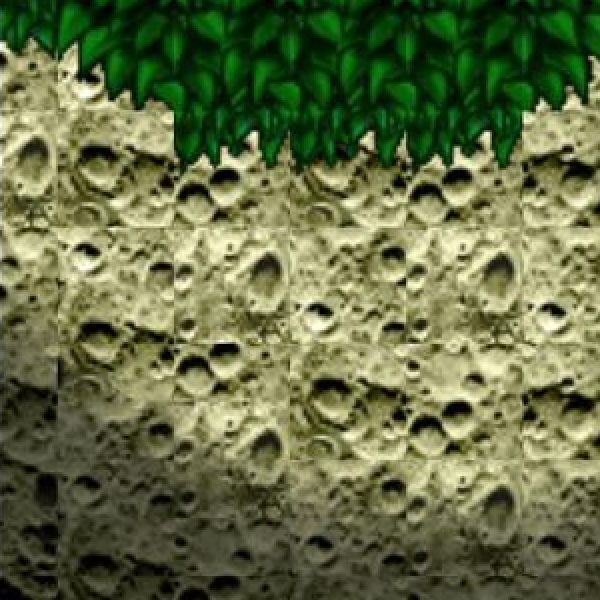 As long as you're just automatically upscaling source art 1:1 without adapting it for a larger resolution you're always going to be vulnerable to issues like this, but you can at least mitigate the issues by composing your tilesets before upscaling. 3. Thou Shalt Not Pollute The Screen With Mixels! Ideally, pick a single pixel scale and stick to it everywhere. Of course, sometimes art choices or limitations might call for e.g. showing some things at double scale, and others at single scale. There's good and bad ways to do this. 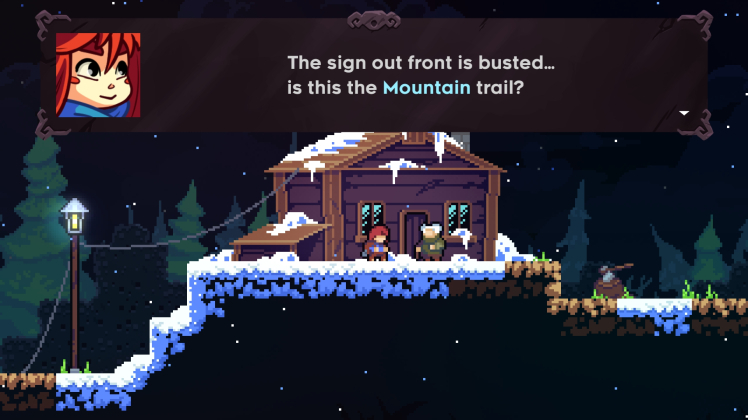 Every pixel in the entire game is the exact same size, except for the pixels used to render text. This is acceptable because the text appears by itself and therefore clashes less with the larger pixel grid, and there's a practical need for it -- it's easier to read high resolution text than pixelated text. 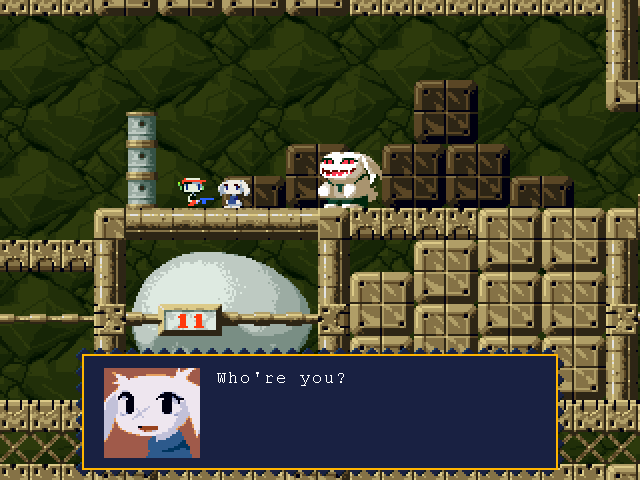 Here, both the text and the portrait use the smaller pixel scale. In general, if you have to use mixed pixel scales, overlays and UI elements are the best candidates for it, and the more you can visually separate them into their own hierarchy, the better. Absent that, at least make sure to align all elements to the same underlying grid, and pixelated images should ideally be scaled at whole-number ratios. 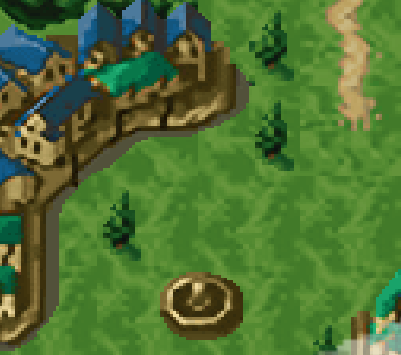 The backgrounds for the buttons are needlessly noisy and pixelated here -- even if they're styled after the original game's UI elements this would have been better just being drawn at the same resolution as the text. 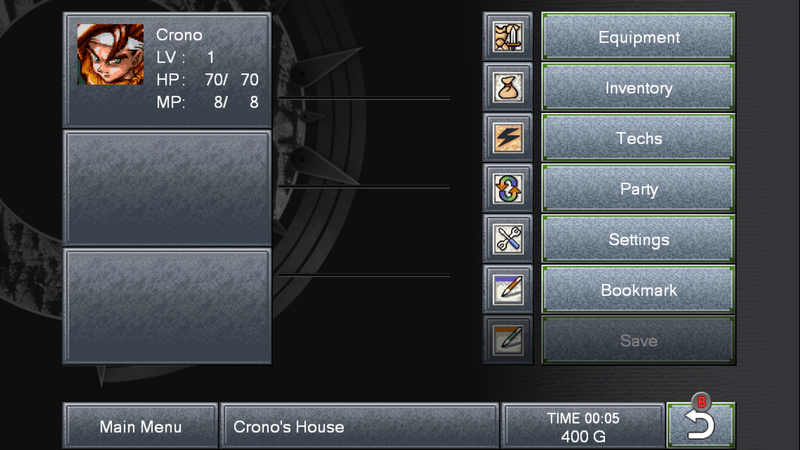 It's especially confusing contrasted with the high resolution icons, background image, and gamepad button overlays. Because they upscaled some of the tile assets, but not all of them, now we've got mixels all over the place. 4. Thou Shalt Respect The Work Thou Art "Improving"
That's just not in the cards, from the looks of it. This is the Gold Standard -- delicious high-res visuals, properly executed, and the ability to swap back to the old audio/music at any time. And nearly a perfect reproduction of the original underlying gameplay, but with modern tweaks such as 16:9 resolution support. Let's not pretend this is easy. You need top tier talent, a good budget, and most importantly, a cohesive, committed vision. Wonder Boy is what happens when you hit all the high notes. Now let's be fair. I own the remake (thanks for the gift, Kjell! ), it can't be denied that a lot of effort went into it, and some people really, genuinely, like it. 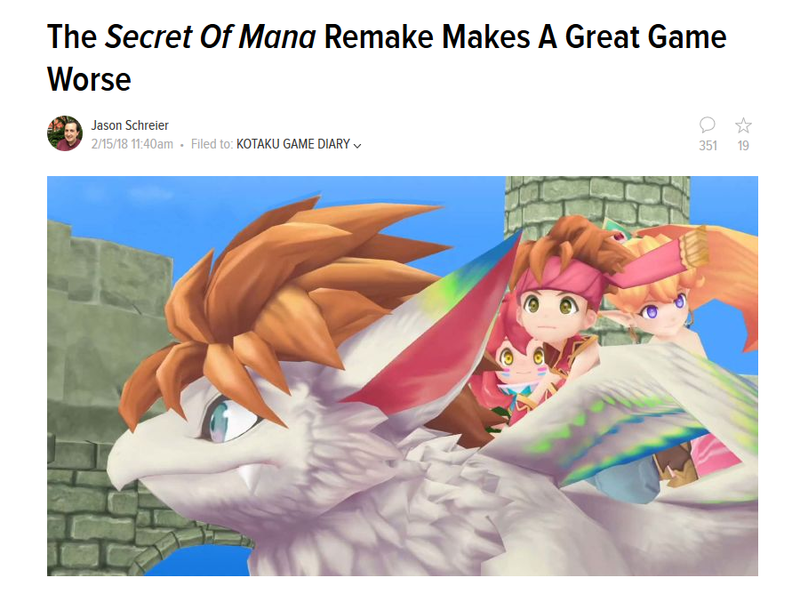 Sure, it had some questionable decisions, and even more clearly it didn't get the proper resources and support from Square, but dangit, remaking a classic beloved game and living up to people's standards is tough, hard, nigh-impossible work, even when you're actually trying. So sometimes, the best answer is not to try too hard. The original game already exists. People love it. People would like to pay money to play it. 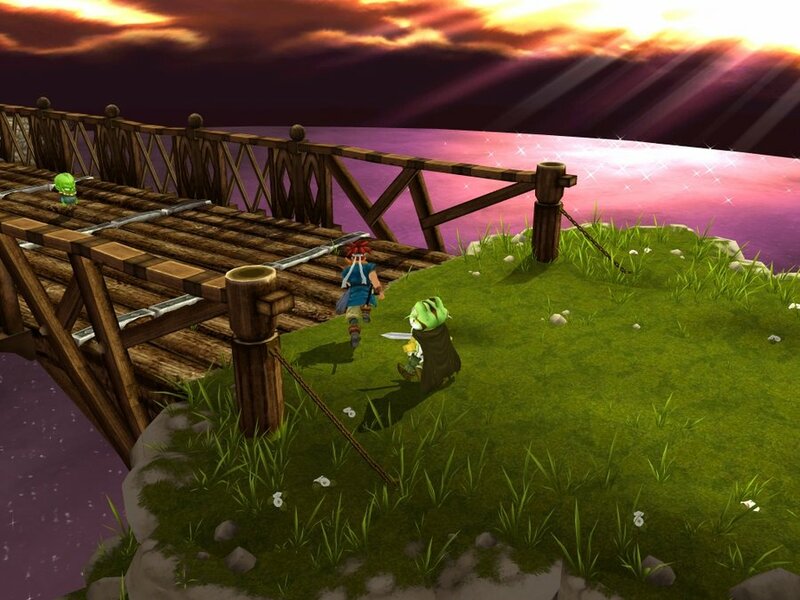 The emulation scene has already come up with fifty thousand different ways to stretch, scale, and shade the visuals in any possible configuration you could dream up. ROMHackers by the plenty have dumped the game, documented its every nook and cranny, fixed bugs, and even created their own editing tools. This is your game, Square! You can take all these efforts (provided you properly comply with all the open source licenses), repackage them and sell it all back to the community, and the fans will thank you for it! And you know, you could always just hire these emulation scene people directly. I mean, that's what the MegaMan Legacy collections did, and they're fabulous! Make HD remakes if you like. But give us a legitimate way to experience the original version of games, too. This is why when I did my own HD remake of Defender's Quest on Steam, I included a copy of the original low-res Flash prototype for free. It still exists, jank and all, and people who want that can still experience it. 5. Thou Shalt Not Poop All Over The Name "Emulation"
Let's get this one out of the way. It's pretty clear that you, Square Enix, care less about the legacy of your own products than the community does. The digital dark age is coming. We are losing our history. 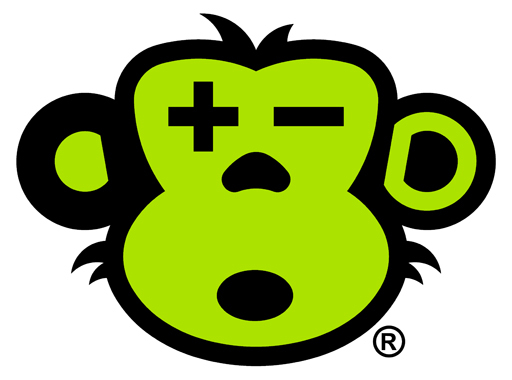 Publishers need to embrace emulation, not demonize it. First, emulation is not a codeword for "piracy," and NO, EMULATION IS NOT ILLEGAL SO STOP PRETENDING LIKE IT IS. Second, although I don't condone piracy in any way, if you are at all concerned about it you have totally failed at your job as a competent business person and you are worried about all the wrong things. For more on that, read Piracy and the Four Currencies. A few years from now, when studio closures, bitrot, failing hard drives, and the industry's own advocates have taken their full toll, it's going to be thanks to the efforts of the emulation community that companies like Square Enix have any digital legacy to preserve at all.